Japanese sweet flag grass is a perennial aquatic plant with sword-like leaves that resemble those of iris. It is often used along the borders of landscape ponds and other water features. Despite its common name, Japanese sweet flag grass is not an ornamental grass, but instead is a perennial that spreads by underground rhizomes. Japanese sweet flag grass has vertical sword-like leaves that top out at about 39 inches in length, depending on variety. It is slow-growing, spreading to fill a 2-foot wide area in about five years. The leaves are typically light green to golden-yellow in color and can help brighten dim garden areas. Small greenish-yellow flowers appear on spikes in spring and early summer, followed by red berries. The "sweet" label comes from the pleasant, spicy aroma the leaves produce when crushed. Japanese sweet flag grass (Acorus spp.) is native to Japan and China. In the U.S., it can generally be grown in USDA hardiness zones 6 to 9, with a few cultivars appropriate as far north as zones 4 and as far south as zone 11. The plant also goes by the common names sweet flag and calamus. The term flag derives from the Middle English word flagge, meaning "reed." Although not natively occurring in North America, settlers introduced the plant in the 1600s, and it now has naturalized in many places. This plant is a good choice for stabilizing damp areas prone to erosion, such as the banks along creeks or landscape ponds. The bright color is good for brightening shady areas. It can be also grown in containers within landscape ponds or other water features. Japanese sweet flag grass works well as a ground cover in boggy areas, similar to liriope plants. Japanese sweet flag grass is a nearly effortless landscape plant to grow. Plant it in full sun to partial shade, in a location that is moist to constantly wet. It often performs its best right at the edge of a pond or stream. When growing Japanese sweet flag in a pond or other standing water, first place the plant in a container, then set it in water less than 4 inches deep. Divide Japanese sweet flag grass in spring every three or four years. The small divisions can be planted in small pots to mature for a year or so before transplanting them into permanent garden locations. 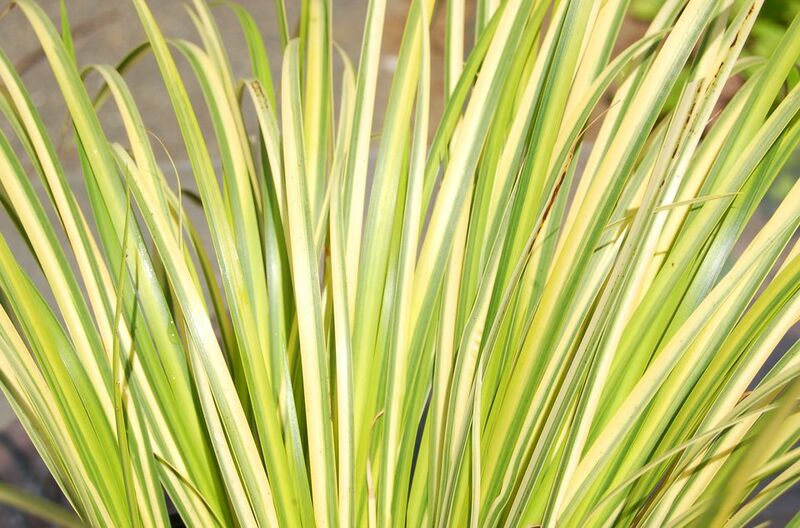 ​Acorus gramineus 'Ogon' has variegated leaves with a green stripe running along one side and a yellow stripe along the other. It is a dwarf specimen, growing to about 1 foot in height and width at maturity. It can be grown in USDA hardiness zones 5 to 9. Acorus calamus 'Variegatus' is another variegated type, this one growing to about 30 inches in height. It, too, is ideal in boggy areas, but will also grow in ordinary garden soil if it is kept consistently moist. It can be grown in USDA hardiness zones 4 to 10. Japanese sweet flag grass is one of the rare garden plants that has no serious insect or disease problems. Scorch can occur if the soil is not consistently moist or wet. Although slow-growing, Japanese can be somewhat invasive in ideal conditions. Where this is a concern, growing it in submerged containers can be the best strategy.